SWM has further moved into Maldives and Northern Andaman Sea. Cross Equatorial Flow has picked up considerably in the Bay and Arabian Sea. Winds over 40 knts are seen gushing Northwards off the Somali Coast, and 40 knts winds, rushing towards NE, are also seen in the Bay. Today's SST map is reproduced here to show the Sea temperature falling sufficiently along the Somali coast. It is presently around 20/21c. Now, this difference with the Central Arabian Sea plays a key role in cloud formations off the Western Coastline of India in the Central Arabian Seas. The SST along the Somali coast will rapidly fall to around 18/20c in the next 10 days. But the current fall is sufficient to help form Monsoon clouds around the Maldives. Cloud formation near Sri Lanka is gathering, and in next 24 hrs, wind speed along the Sri Lanka coast is estimated at 40knts (in gusts). The ITCZ is slowly moving up, but is still around the Equator regions, and in the 7N region in the Bay sector. SWM should set in over Sri Lanka within next 48 hrs, that is by the 27th May. The Seasonal Low seems to have strengthened. We see today's pressure at 998 mb. Getting gradually ready enough to create a gradient to pull up SW winds into the mainland. The day temperatures on the Sub-Continent Northern plains are on the higher side from this week with the average the day's highs are around 43/44c. Across in Pakistan' Sindh region, the core area for the formation of the low, the highest has already crossed 50c. M-3 effect is expected bring about a slight fall in the day readings. M-3 (weak) is seen moving into India. 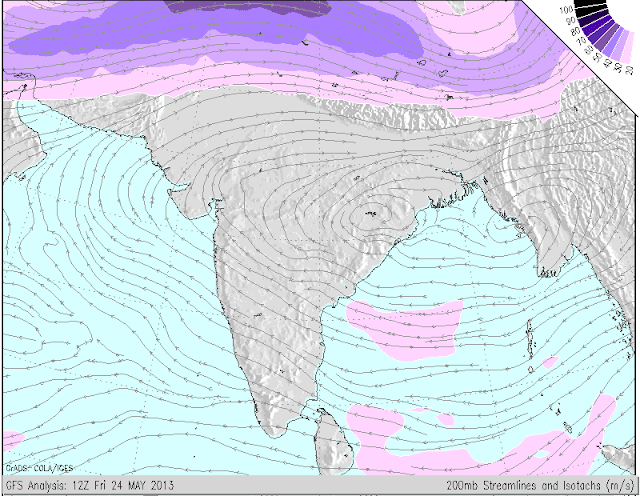 The Jet Stream Westerlies are almost upto the 15N line, and the "High" formation is taking shape in Eastern India. Expected placement of this "High" should be inland towards MP for perfect position. As SW winds have picked up speed,a Low could form in the Northern Bay off the Bangladesh coast by the 27th. In the next 3/4 days, SWM, could advance further into the Bay. UTH map shows the "utmost" readiness for a low and further advance in Bay of SWM. Better this happens before another WD reaches the region to spoil the "party". Changes in 850 hpa winds (anomaly) show a reviewed MJO pattern. Neutral in our seas till 5th June, but strengthening from 5th to 16th June..and thereafter going back to neutral as the wave moves Eastwards. 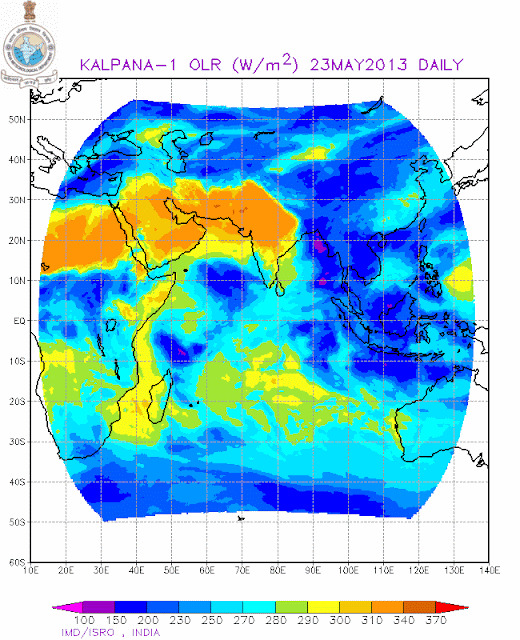 SWM advancing into Sri Lanka by 27th.May. Advance into Kerala and Southern TN around Vagaries'expected date, 1st/2nd June. But, further advance would need monitoring. Possibly into Coastal Karnataka/Goa and TN regions by the 5th of June. South Konkan 6th/7th June, and Mumbai by 8th/9th June. SWM advance in to NE states by 29th/30th May. Keep Checking Monsoon Advance Position in vagaries. An trough off the west coast of India may form and result in thunders shower in and around Mumbai, S.Konkan, Goa and coastal Karnataka Sunday 26th/Monday 27th. Pre- Monsoon showers expected around Mumbai vicinity on 26th may/27th May. Pre-Monsoon thunder showers increase after 3rd/4th June. Vasai received moderate showers for a minute at 5:00 am today. So only coastal places are having passing showers !! Several suburbs of Mumbai like kandivali, goregaon reported drizzles on Sat morning..
Rajesh sir ,Unlike last year's Monsoon "Look's like this year Vasai, Mumbai and entire Konkan belt and Goa will have better monsoon. Rajesh Sir, when monsoon will advance into interior AP and North Interior Karnataka ? Will it happen before 10-Jun. But very unbelievable that in spite of low clouds presence and W/SW sea breeze how come Colaba crosses 35c !! exactly dataraj joshi and very same I was trying to convey to others. Myself stayed in BANG for last 8 years - only during pre-monsoon period it rains few mms(100mm-120mm) and entire monsoon season whole interior KAR, RAYALSEEMA remains dry). Other strange fact was july-aug remains very windy and all clouds are carried away - lack of trees and concrete mess deprives any sustainable rain drops. cloudy and humid conditions here at Vasai. @ Sam. Lucky u. Whether showers were enough to make all wet around !! ending 8.30am.. Now waiting for Dombivli/ Badlapur's turn !! @Abhijeet, yes we have been gettting these passing showers, since yesterday sometimes even in the evening here at Vasai, but eagerly waiting for real thunderstorm of the season. hi rajesh sir i always wait for a post as i m from mumbai and eagerly waiting for a good news ,till now now no pre monsoon shower has yet fallen. Thanks a lot for the wishes Sam and Rohit.Rohit, did not know of your hidden talent ? Dattaraj: The SWM advance map shows my views on the advance of Monsoon. Lets hope it remains as per date. If there are changes, shall inform on vagaries.